"Chevrefeuille" (or Honeysuckle) is a very spacious and comfortable 2 bedroomed cottage ideal for couples or families. The cottage is fully self-contained and equipped to a high standard throughout. The master bedroom has a double bed, the second bedroom contains three single beds. It is fully self-contained and equipped to a high standard. Electricity, Gas, Hot Water, Bedding and Towels are all included. There is a sunny terrace for al fresco dining and our large attractive gardens provide an ideal location to relax or play. •Comprehensive Information About Things to See and Do in the Local Area, Attractions, Markets etc. Helen and Carl lived in South Devon for many years before moving to Brittany in 2012. We have worked together in the Tourist Industry for many years and we love welcoming guests and sharing this beautiful place with them. We are both musicians and we enjoy taking part in local events and festivals. Our love of music has been a great asset with integration in the local community. We fell in love with this beautiful Breton Longere at first sight. We have been visiting Brittany for many years - often 2 or 3 times a year. We moved here in April 2012 and we now live here in beautiful Brittany full time. The 200 year old farmhouse with stone longere set in 2/3 acre of beautiful gardens simply entranced us. It is just 10 minutes walk from the pretty little Breton village of St Mayeux, yet there is virtually no passing traffic and most days the only sounds are the birds and bees. Perhaps the most beautiful feature is the attractive enclosed garden. The rural location is so peaceful and at night-time we have no light pollution so the stars are wonderful to see. Situated in the centre of Brittany we are ideally placed for visiting the many splendours of this wonderful region of France. The stunning Lac de Guerledan is just 10 minutes away for sailing, cycling and walking or just relaxing on one of the three sandy beaches. Rural, peaceful location with stunning countryside views. Spacious and comfortable accommodation, fully equipped to a high standard. The wonderful garden is a joy to relax in. It is a mature garden with many trees and shrubs. There is a sunny terrace and plenty of trees to sit in the shade of whilst enjoying a glass of wine or beer. Plenty of tables and chairs provide the perfect setting for eating al fresco in the long summer evenings. Bathroom is on the first floor. Shower cubicle with glass door, large shower tray and dual head shower. Washbasin and WC. Heated towel rail (thermostatic). Local facilities include village shop, post office, bar and restaurant (lunchtimes). Supplementary electric and gas heating. Thermostatic heaters in each bedroom, heated towel unit in the bathroom. Wifi Internet in all areas. High speed fibre-optic connection. Terrace with table and chairs to seat 5 people in comfort. Addtional garden chairs available. Gravelled access, all bedrooms are on the first floor. Staircase is steep with open treads. Ideal for couples or families. As we have two cottages a larger family can be accommodated. Notes on accommodation: All gas and electricity included. Cots, high chair and stair-gate also available if required. Free Wi-fi available. Logs available at € 5.00 for a large basket. Small charge for use of washing machine and tumble dryer. 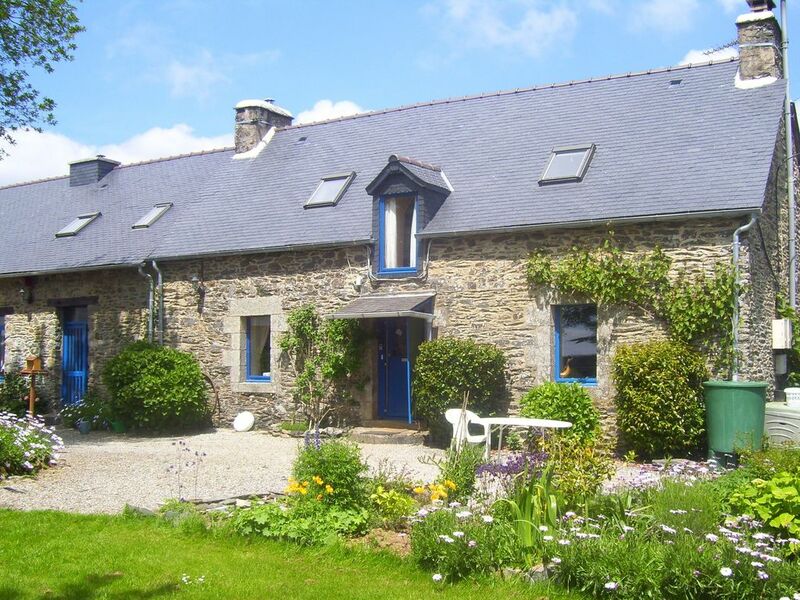 Outside: Le Boterff is located in a peaceful rural setting, in an acre of established sheltered, attractive gardens with mature trees and shrubs. There are beautiful views of the Breton countryside. There is a sunny courtyard at the front of the gites with tables and chairs provided for each gite. Other garden furniture and outdoor games supplied. There is a gravelled parking area at the front of the property. Utility Room: Shared laundry facilities include Washing Machine and Rotary clothes line. Iron and ironing board provided in the cottage. Tumble dryer available on request. Breakfast is usually available on request at an additional charge. Super, large house in a lovely quiet area. The description is accurate. The gite is large downstairs, a fantastic feeling of space, upstairs is smaller but still feels big. The kitchen is big and well equipped. It was all nice and clean. We enjoyed being able to play on the lawn, and explore the grounds, and the lane was perfect of longboarding, with a super long downhill! Really easy to walk to the village to buy bread every morning, we rarely met a single car! The owners were away, so we met with the caretakers, Kevin and Lisa, who were very nice. Its location meant we could drive out and visit north or south Brittany. Enjoyed Lorient German WWII Submarine base, Binic beach, and the Gorges. And, of course the lake where we swam and went paddleboarding. All in all, a super week! Thank you! Thank you for your review. We are very sorry that we weren't here to meet you in person but we are very glad that you were well looked after by Kevin and Lisa. We are pleased you enjoyed your holiday at Le Boterff and we hope that you get an opportunity to visit us again one day. You would be very welcome. Merci beaucoup. C'était un grand plaisir de vous acceuillir chez nous. Lac de Guerledan is only 10 mins drive away with 3 safe sandy beaches, boating, water-sports and pleasure craft (in summer months). There are several other smaller lakes nearby, ideal for fishing, swimming, boating or relaxing. All sea coasts are easily accessible from Le Boterff. The north coast at Binic or Le Val André can be reached in approximately 40 minutes. The south coast at Guidel Plage is just over an hour away, Vannes, the Gulf de Morbihan and the Pink Granite Coast can be reached in just over 1 hour and the far west coast of Finistère can be reached in 1.5 - 2 hours. 20% Discount off Brittany Ferries fares available when you book with us. Ferries - St Malo 76 miles, Roscoff 78 miles, Caen 175 miles, Cherbourg 195 miles. Airports - Brest 82 miles, Rennes 73 miles, Dinard 69 miles, Nantes 122 miles. Pontivy (20 Mins) - Attractive Medieval town - full range of large supermarkets and shops, market, Chateau, river, Nantes-Brest Canal. Fabulous beaches and coastlines to the south, north and west reached in less than 1 hour. Dinan (1 hour) - superb medieval town. Moncontour (40 Mins) - World Heritage Medieval village. There is so much to do in the area with the stunning Lac de Guerledan only 10 minutes drive away and only 15 minutes to the Abbey at Bon Repos. Chateaux, pretty villages and Medieval walled towns of historic and cultural interest, such as Pontivy, Josselin, Quintin, St Brieuc and Quimper are all within easy reach. Many towns have traditional French / Breton markets. There is a post office, small supermarket (fresh bread daily) and bar in St Mayeux. There is a range of Cafés, Bars, Restaurants, Bistros all within easy reach where you can sample anything from a coffee or glass of wine at a street café to local Breton specialities such as seafood, crepes and cider, or the full Gourmet experience at Michelin starred restaurants. The small town of Mur de Bretagne (6kms) has a Bank, Post Office, 2 Pharmacies, 2 Boulangeries, Cafés, Restaurants, Supermarket and Petrol Station. This is a superb area for cycling and walking with many dedicated paths and very quiet country roads. They range from very easy (along the Canal) to challenging (Part of the route of the Tour de France is very close by). The fantastic Breton coastlines to the north, south and west are easily reached on good roads. The nearest coastal beach is at Binic, about 45 minutes away. The nearest lakeside beaches are at Lake Guerledan and Lake Bosmeleac - 10 - 20 minutes away.